“Just when one commences to evolve more or less definite ideas about pianoforte technic and pianoforte teaching is difficult to tell; but it is safe to say that nothing one has ever done from childhood up is lost. That is, from my very first lessons with a Swedish teacher named Crysander, there have been a series of experiences in what to do and what not to do which form the background of all of the public playing and the teaching I have done. From the very first I was thrown in a musical atmosphere. My father was an orchestral musician. He played the trumpet in the orchestra at the Imperial Opera. Rubinstein was one of his firm admirers and always liked to hear him play. Accordingly he placed me with a Swedish teacher named Crysander, who had come to Russia as the conductor of a Swedish choir. Cryander (sic) was the author of A Beginner’s Method and I am afraid that he thought far more about correct hand position and elementary technical exercises than about developing the musical qualities. His main object was to get my fingers to move as correctly and as precisely and as rapidly as possible. Of course, the ideal way with a child is to develop the child’s esthetic sense in a very simple way along with his technical development. I am also a firm believer in having the child taught to play from memory, from his very first pieces. This is not merely because it is the convention in these days to play everything from memory, but it is hard enough for an adult to play expressively with the eyes glued on the notes and when a child is confined to the notes. Again it is much easier to teach memorizing when the child is young than if this drill is deferred to a later year, when other studies crowd in more rapidly. Crysander did not teach me to memorize, and that was always a source of regret to me in my later student days. For six years I was constantly under the care of Crysander. He developed a good technic in the old-fashioned sense. That is, I could play with speed and some force, but my fingers were frightfully stiff. In fact, after a few hours’ practice my fingers would feel exceedingly tired and would ache painfully. I saw other players perform for hours with little apparent effort and I knew that I could not be upon the right path. By this time I had played several Beethoven Sonatas and many Liszt arrangments (sic), such as the Wagner-Liszt Tannhaüser March, etc. It was at that time that I went to the conservatory and became the pupil of Safonoff. Tanieff was then the director of the conservatory and the directors insisted that although I was technically able to enter I was not old enough in years. Accordingly Safonoff taught me privately in his home for six months. It was difficult to forget my chagrin when I learned that I would have to go back to the five-finger exercises as found in Hanon’s exercises. That was a great fall from the Tannhaüser March. Safonoff, however, told me that the reason for my getting tired at practice was that I had never given my muscles a chance to get strong in the right way, and that I was straining them all the time. He would tolerate no stiffness, but at the same time he would not permit the slightest hand motion. He repeatedly put things on the back of my hand, while I was playing scales and five-finger exercises, with the injunction that I was not to permit them to fall off. In order to do this the action at first was purely one of the fingers, but, at the same time, I had to strike the keys over and over again without the slightest strain. He was one of the most careful and insistent teachers one could possibly imagine, watching every muscle as a cat would a mouse, never letting me progress a note unless the hand conditions were entirely without strain. This was one of his secrets, minute attention to every detail. American audiences must have noticed that when he was the conductor of the New York Philharmonic Orchestra. He had many definite ideas about various phases of pianoforte playing. One was that the thumb should be suspended in a natural position under the curve of the hand in scale playing. That is, in the ascending scale of C, for instance, in the right hand the thumb strikes C and the moment the next note D is struck with the second finger the C is released and the thumb moves rapidly, lightly and gracefully at once under the second finger. This keeps it in playing position all the time and forms a habit that becomes very valuable to the player in later years. He also insisted that the wrist should be free at all times when the fingers were playing. It seems very easy to say, but it took me years to accomplish it. More than that, one must know how to use the wrist, in finger work, in order to produce required effects. For instance, in a passage like the following, one soon learns to raise the wrist at the top note of the passage to get the proper accent, which the little finger alone can hardly be expected to give. At the termination of such a run in either direction, in either hand, the elevation of the wrist brings certain arm muscles into action and finishes the run in either arpeggio or scale form, definitely and clearly. This is also the case where the thumb has to be used upon the black keys. Scales, it seems to me, are the basis of the development of a perfect technic. I always have been a firm believer in them. I am aware that some seem to think that they are not necessary, but anyone who has sat beside pupils and watched the almost magical effect that the right kind of scale drill produces upon pupils at a certain stage of advance could not fail to be convinced. Of course they must not be played in a perfunctory manner. Rubinstein could play a scale so exquisitely that it was almost heavenly. You held your breath with the beauty of it until he had touched the last note. A perfect scale is one of the hardest things to play. That is, a scale with evenness and quality. One should play the scales until they become absolutely effortless. My wife is an excellent pianist, with also a diploma and gold medal of the conservatory. Safonoff used to say that she seemed to shake the scales out of her sleeve. That is a very good expression. Not until the student can shake them out of his sleeve can he play them well. His fingers should fall into their proper places automatically. There should be no need for thinking about what notes to play or what fingers to use. If there is any such thing as that he should go back and play them very, very slowly, until he knows them. If in pronouncing a word one has to stutter or sputter over it, there is only one cure and that is to say the word in its proper syllables over and over with the proper pronunciation very slowly. It is precisely the same with scales. Fluency comes with knowing, and knowing comes with very slow playing. I was with Safonoff for six years and he invariably asked for scales at each lesson. I do the same thing with my own pupils. At the same time no exercise should be mechanical. Someone created a fiction that a great pianist used to practice and read a book at the same time. I can scarcely credit it. If I were to practice it in that way every moment would be wasted. In fact if I am to accomplish anything at all I must concentrate every second. If after playing for two hours, let us say, I find that irrelevant thoughts persist in coming up in my mind, I stop and do something else. It is a sign that my mind is tired and must have a rest. I do something else for awhile and then go back to practice again. Concentration and interest are the secret of success in pianoforte practice. Any concentration without interest, that is, concentration that is manufactured by the will power, will not do. You must be mightly (sic) interested. Your concentration must be the result of a most intense desire and love for what you are doing. You must be happier while you are practicing than when you are doing anything else. 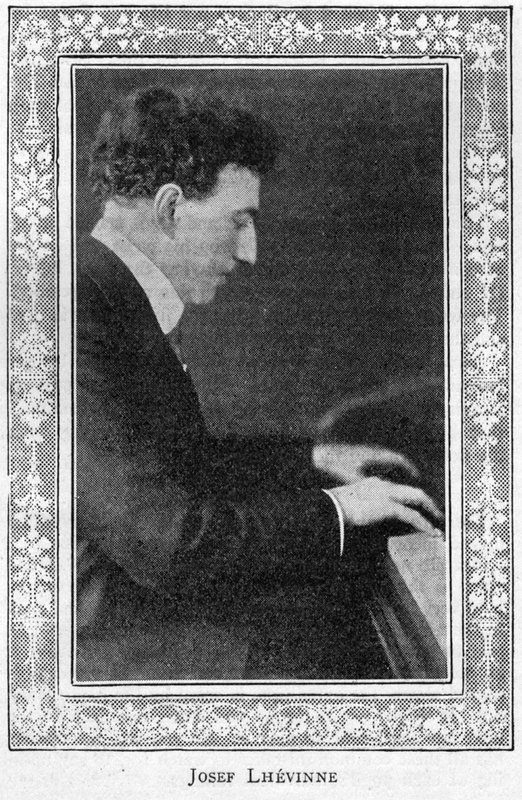 You are reading Josef Lhévinne - Practical Phases of Modern Pianoforte Study from the March, 1921 issue of The Etude Magazine.